"Remember, the Force will be with you… always." You activate your character. You roll in your dice. And your game of Star Wars™: Destiny explodes into action—thrusting you into the thick of heated battles between the Star Wars galaxy's greatest heroes and villains! Darth Vader and Boba Fett may team up against Luke Skywalker and Han Solo. General Grievous and Kylo Ren may try to take down Mace Windu and Maz Kanata. Or Rey and Saw Gerrera might lead a Padawan on a desperate mission against General Hux and his squad of First Order Stormtroopers… No matter what team you field or which characters you face, you'll find the action is fast and furious, full of tricks, cunning tactics, and Force powers—and it's even better when you begin your Jedi training by joining the Organized Play community. Organized Play exists to help you find more games, meet new players, make new friends, and enjoy the best of all that Destiny has to offer. 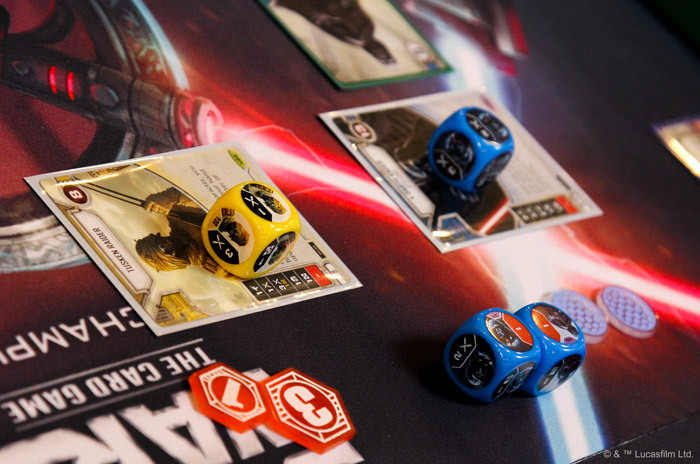 The more you play, the more you'll learn the ways of the Force—how best to time your attacks and defense, how best to manipulate your dice results, and how your charaters can better complement each other. More than this, you'll also place yourself in the running for cool prizes to customize your decks and upgrade your play experience ! Perhaps the best thing about the prizes for Destiny Organized Play is that you don't need to confront Darth Vader in order to claim them. In fact, you don't even need to make your way to the top tables in order to walk away with new ways to spice up your favorite Destiny decks. The prizes for your local Clash of Fates tournament come with prizes for all the Top 16 participants, with additional Elite Prize Cards and Elite Prize Items available to the Top 4. Top 16: Alternate art The Force Is With Me. You must learn control if you hope to improve at Destiny, and The Force Is With Me provides you with an efficient means of timely dice removal. This is especially valuable in the new Trilogy format and if your local meta is bombarding you with all kinds of indirect damage. 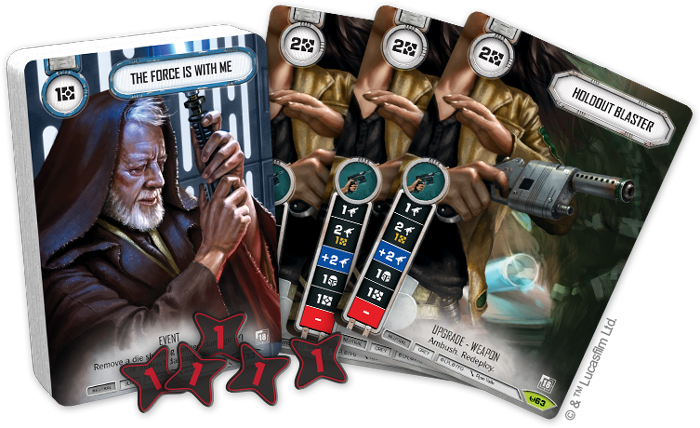 And while it's true that you'll also need to deal damage to defeat your opponents' characters, the extended artwork—which depicts Obi-Wan right before his selfless sacrifice—reminds us that our games of Destiny are full of dramatic turns. Sometimes we need to sacrifice a beat of momentum or even a character in order to play toward the ultimate victory. Elite Prize Card: Alternate art Holdout Blaster. The Holdout Blaster is a staple among the galaxy's smugglers and scum, and its new extended art has it almost leaping out of its holster, ensuring you're ready to shoot first at a time of need! Elite Prize Item: Set of five acrylic damage tokens. You win your games by taking as little damage as possible—all while dealing it out in copious amounts. Unless you're playing a "mill" strategy based around emptying your opponent's draw deck and hand, damage is at the heart of your strategy, and these acrylic damage tokens make every point of damage more dramatic with their smoky black base and red design. The time's come for a good, old-fashioned, stand-up fight. Fulfill your destiny when you talk to your local game stores to find Destiny Organized Play events near you!